With plenty of places in London serving up High Tea, one of the things that really makes or breaks the experience for me (apart from the scones of course) is the setting. And if there’s a place that screams ultra-chic, contemporary elegance like no other, it’s South Kensington’s newest Boutique hotel – The Ampersand. Barely a month old since it’s stunning makeover, The Ampersand oozes lush out of every piece of furniture, fabric and artwork that’s been assembled in its gorgeous interior. Bright hues of maroon and turquoise from the leathers and fabrics of the Drawing Rooms inject a sense of life into the place, something so many hotels seem to lack these days. Even the more eclectic pieces seem perfectly in place… everything from the abstract paper lampshades to the avian-themed upholstery to the towering vintage coffee machine gleaming away by the pastry counter. It’s an interior decor masterclass in how to make British stylish. Once you take your seats for afternoon tea and sink into the velvety couches and armchairs, you will never want to leave. As you unwind with a flute of bubbly in hand, choose from a wide selection of premium teas and coffees to accompany the savouries and sweets to come. Food-wise, it was hard to fault anything really. The selection of open ‘tartine’ sandwiches were brimful of bold flavours. Thick-cut Wiltshire ham, glazed with honey and spiked with a layer of tangy gribiche sauce was delectable. A classic smoked salmon, cream cheese and dill combo, topped with huge spheres of juicy fish roe which burst as you bit into them also impressed. 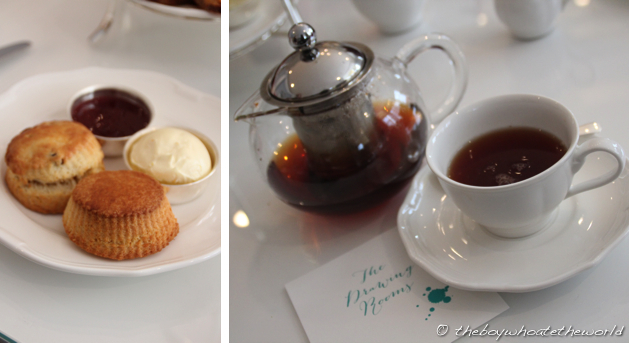 And onto the scones, the holy grail of any High Tea experience. Served with clotted cream and jam on the side, the texture was a beautiful balance between crumbly and moist butteriness. Textbook and bang-on perfect. An assortment of petits fours brought the curtains down on a lovely afternoon: raspberry and lemon macarons, moist opera cake, zingy lemon tart, and a salted peanut Florentine. Whereas petits fours can so often result in a food coma from an overload of sugar, the fresh, contrasting flavours here helped to keep things incredibly light. With such fab pastries, bubbly and tea in what has to be the lushest of settings, it’s a terrific High Tea experience on the whole that was great value on Lime & Tonic’s 2-for-1 deal (£25 for 2 people, available for a limited time only**). I for one would happily return to the Ampersand Hotel’s Drawing Rooms, if not for High-Tea, simply to wile away the afternoon over a coffee and become part of the furniture here. ** Stay tuned to Lime and Tonic London’s website or follow them on Twitter (@LimeTonicLondon) for more offers of this sort! 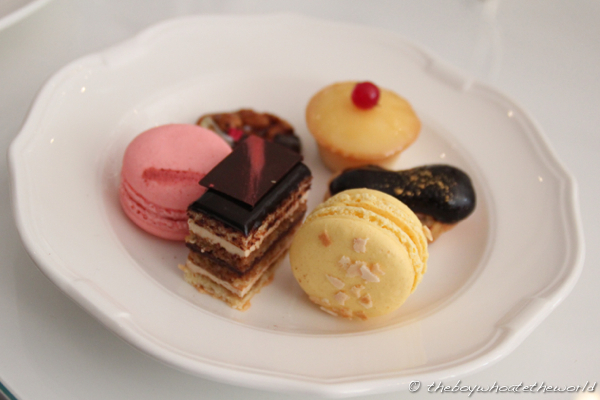 So I tried out the high tea at Lanesborough and I think it was rather lacklustre… Will write more in my post! Stay tune! Ah, shame to hear. Will look out for the post! Think best I’ve had is still the Connaught. This one was pretty good as well on the 2-for-1! This is not high tea. 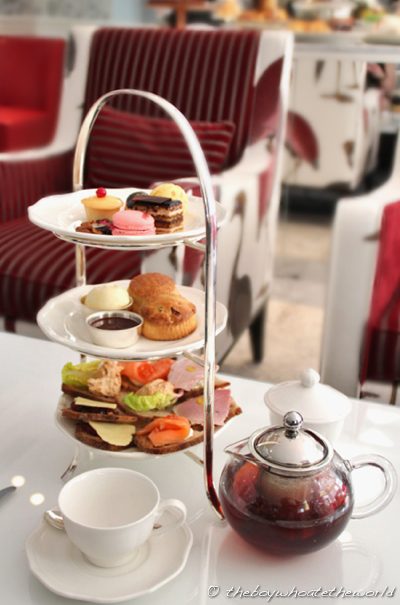 High tea has a hot dish included as found at nursery teas in the best high class households. Your photos show afternoon tea. @Wendy: Thanks for pointing out Wendy. In all honesty, I never knew there was actually a difference between afternoon and high tea!